Food festival for all foodies and keen cooks, this is 2013's food extravaganza featuring famous chefs such as Greg Wallace and The Fabulous Baker Brothers. 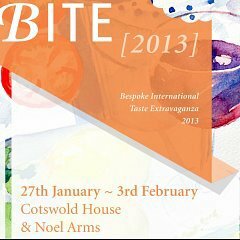 Hosted at two venues in Chipping Campden, BITE promises to be a week of incredible food, laughter and drink in darling Gloucestershire. It is a celebration with those close to you, enjoying the one thing that unites us all: food. In association with culinary names like Villeroy and Boch, The Good Food Guide, and Fork magazine BITE will not disappoint! Prices vary for each day and each event. See website for details, and be quick, because tickets are selling like hot cakes!